FIRM HISTORY - SCOTT P. EVANS ARCHITECT & ASSOC. P.C. At this point in my life my dad just left the company he had worked with for the last 20 years. It was Lorenzo S. Young and Partners who eventually became the current architectural firm of FFKR. He had just become licensed and was offered a partnership in this firm. He declined the offer and set out on his own to establish his own practice. He had just rented some office space on 4th South in Salt Lake and was sitting at his drafting table in the basement of our home laying out the floor plan of the new space. In it was his private office, secretarial area, and the drafting room which had 5 drafting tables. I remember walking up to him, pointing at one of the tables, and asked him what this was. He said that it was a drafting table. I asked whose table this was. He said that it was “mine”. Bingo, the lights went on and were flashing. This was a defining moment in my life. I sensed he saw the ability in me to follow in his footsteps and from that moment I knew I would. Two years later he hired me at $.25/ hour to come in during the summer to sit at that very table and learn to “letter”. This was long before the advent of CADD. Everything was done by hand. He took great pride in his drawings, and, to an extent, his work was an art form in itself. I loved the experience and will always remember it. Scott continued in high school enjoying drafting and wood shop. In 1966 he started his training at the University of Utah. 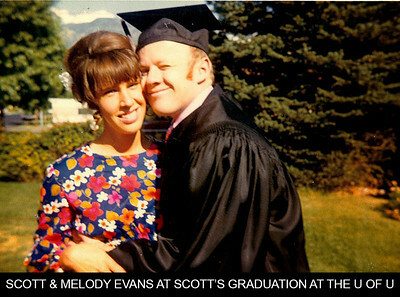 He married Melody Jamison this first year and had two children by the time he graduated with a Bachelor’s Degree in 1971. Just before his graduation he joined the firm of Edwards and Daniels, where he continued working until 1978. He was under the direct tutelage of Judd Daniels, the principal designer of the firm. From him he learned a lot and developed his design skills. This was a great training experience for Scott. Scott became licensed in 1975. As he continued to work for Edwards and Daniels, he attempted to do some projects on the side. His first project was an addition to a nursing home in Bountiful. It was affectionately called “Pappy’s Rest Haven”, named after its owner John Pappadakis. A few years later Scott again had the opportunity to work with his father. His office/home was two miles up Emigration Canyon. This was a beautiful environment in which to work. As a licensed architect he designed a couple of Alpha Beta stores in Albuquerque, New Mexico and a library/classroom addition to Davis High School. He worked there for about 1 year. His dad then decided to make a major change in his life. He moved to southern Texas to become a “gentleman farmer”. In 1979, Scott then had the opportunity to join Shirl Cornwall and Gary Fife in the firm of Cornwall Associates. Shirl hired Scott to come in and manage his Salt Lake Office. Shirl’s home and main office were in southern California. In 1981, Scott and Gary joined Shirl and established a new architectural firm named Cornwall, Evans and Fife. They worked briefly in an office on the west side of 4th South. One of their clients, Akerlow, Thomas and Dyer were developers of local office buildings. Scott had the opportunity to design a three story office building located at 155 South 300 West, in Salt Lake. This became their new home for many years. Over time Scott totally took over the business and renamed it Scott P. Evans - Architect and Associates P.C. and moved into its present office located at 108 West Center Street, Bountiful, Utah. Scott’s vision of his business now became one of a “family farm”, an old concept where family member would work together for a common good. In today’s world, this is hard to achieve. Most families separate and move all over the country. By now, Scott and Melody have 4 grown and married sons and a slew of grandkids. Today’s office demographics include 3 of the 4 sons and other employees as needs dictate. Greg, the oldest, has been working for Scott in some capacity since 1991. He is a great asset to the firm as a draftsman, office manager and an information technology expert. He has also become a very talented and proficient photographer, a skill that is used often in the office. Jason has been working for Scott full time since 2000 and handles the marketing and construction management duties for the firm. He is a talented writer and has excellent computer skills. Jakob, has been working for Scott since 1999. His nickname is “Radar” because he knows what is needed before we ask. He is very proficient in Autocad and can usually complete a task even before it can be spoken. Jakob also has a keen sense for design. We have been blessed to have the opportunity to develop many special relationships with some great clients and associates. We are always looking to expand those relationships and build new ones.